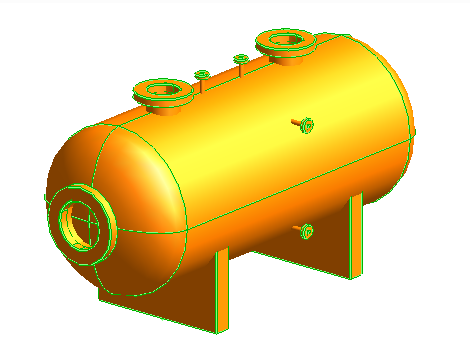 How to create 3D Primitive PDMS Horizontal Vessel easily ? 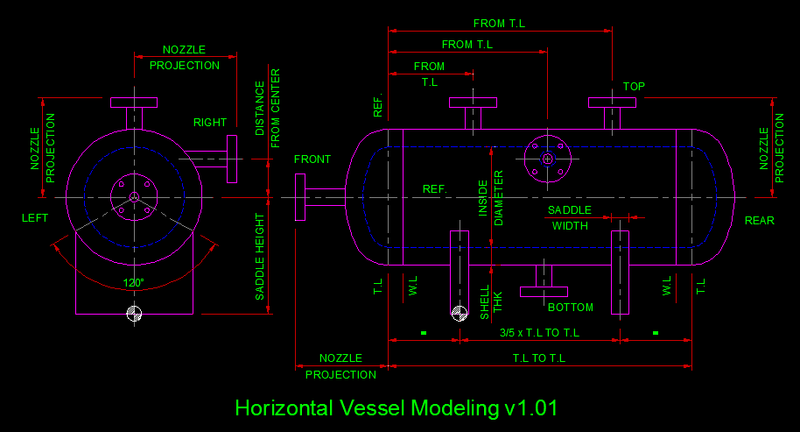 This macro is made from PML Language and be designed to create horizontal vessel in 3D (PDMS) easily with input design parameter only, see horizontal vessel modeling picture in this post below. Why should we use PDMS Macro Horizontal Vessel Modeling ? Create a simple 3D model Horizontal Vessel quickly. Reduce time to creating 3D primitive that not efficient in 3D design phase. No need PDMS Training about 3D Primitive. 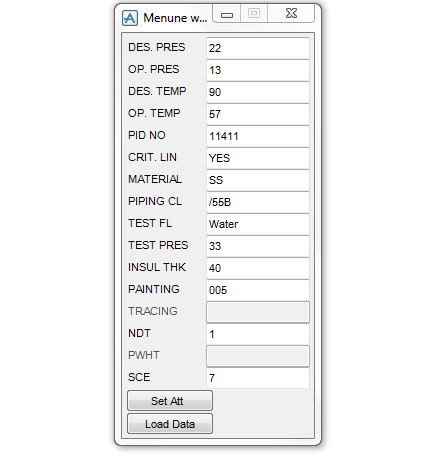 Easy to use, no need to setting from PDMS admin side just drag / drop file or command macro file to show the menu. 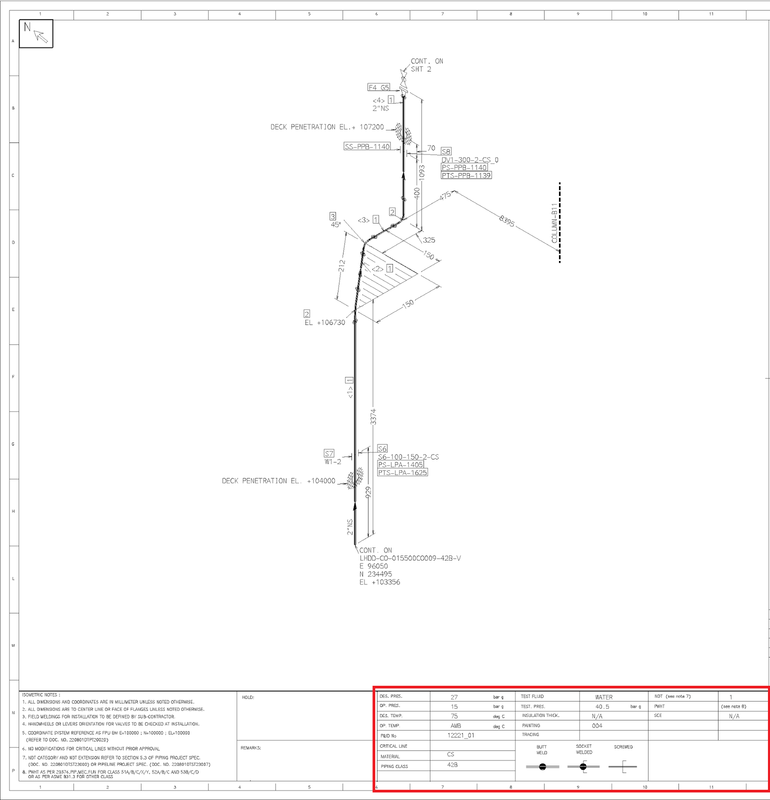 Include PDMS training manual pdf about how to setting this macro. Inside Diameter : Inside diameter of vessel. Shell Thickness : Shell thickness of vessel. T.L to T.L : Distance between tangent line to tangent line. Saddle Height : Height of skirt support. Saddle Width : Diameter of base plate. 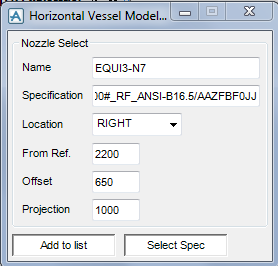 Nozzle : List of Nozzle Name, Specification, Type, Distance from Ref, Offset and Projection. 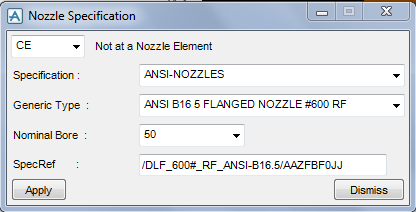 Add : Show Nozzle selection form to set nozzle data and add to nozzle list in Main form. Remove : Remove nozzle data from nozzle list. 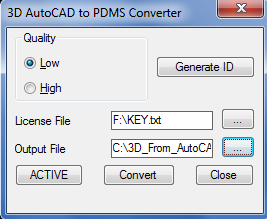 Create : Button to generate 3D primitive on PDMS workspace. Name : Add nozzle data to nozzle list in main form. 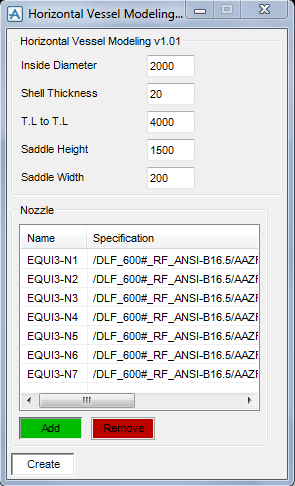 Specification : Add nozzle data to nozzle list in main form. 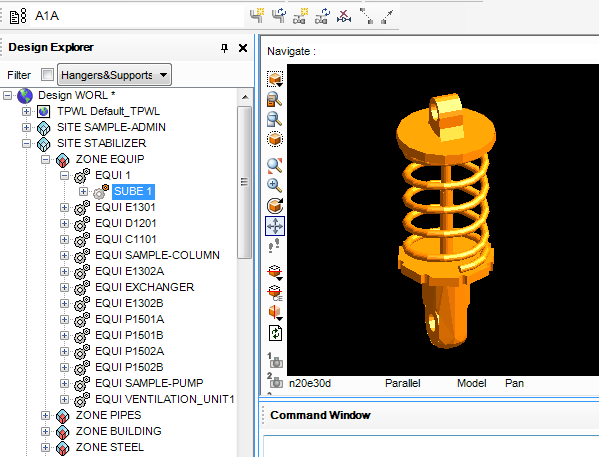 Location : Add nozzle data to nozzle list in main form. From Ref : Distance Nozzle from Tangen Line (Ref. line) of Vessel. Offset : Distance Nozzle from center line of Vessel. Projection : Nozzle Projection (Nozzle Length). Add to list : Add nozzle data to nozzle list in main form. Select Spec : Show nozzle specification selection form and choose nozzle specification. 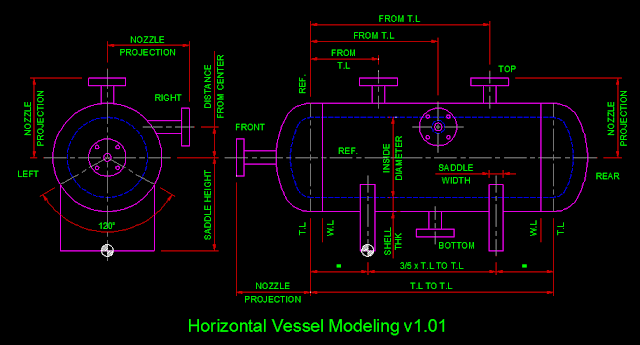 Fill data in PDMS Macro Horizontal Vessel form, for reference please see Horizontal Vessel Modeling parameter below. Click Add and will show Nozzle Select form. 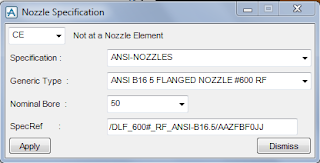 Fill data of nozzle with click Select Spec button to choose nozzle specification and click Add to list button to add nozzle data to nozzle list. Click Remove to remove nozzle data from nozzle list. 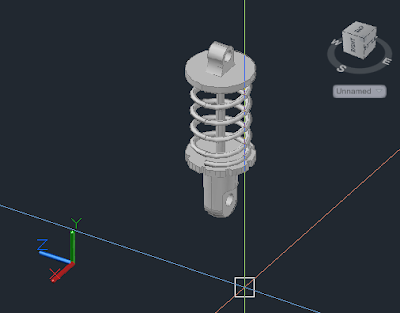 Click Create button to generate the 3D model ( primitive ). Why use PDMS Macro from nggokabeh.com ? Can be used by PDMS designer or modeler without instalation from admin side. Without PML index setting so can be saved in local folder, let's say personal use only. Facilitate private job so others don't know using macro or not. 100% support and feature update. Goto (PDMS macro download) page to get Horizontal Vessel Modeling v1.01 and another tools for optimize your job result. 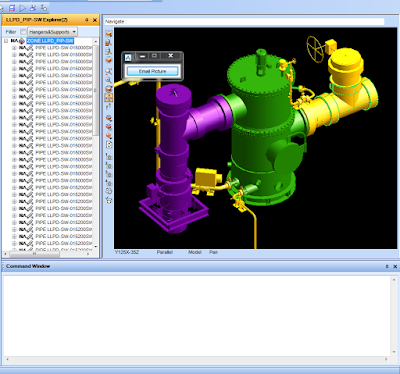 This PDMS Macro is made from PML programming used to reduce time from screen shoot and save file to local disk. Why should we use Macro PML Email Graphical View ? Reduce time to attach of screen shoot picture to email. Save JPEG file to local disk as gallery, summary or history. Email Picture button : to send email of PDMS graphical view as attachment by Outlook and automatically save a JPEG file into local disk. select an item to give a name of attachment. 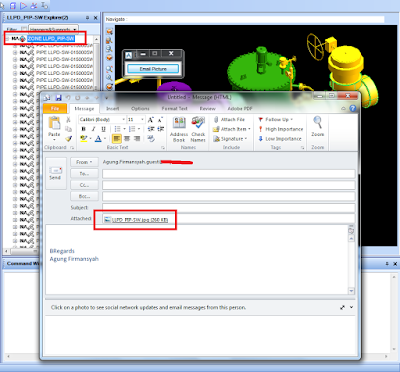 This picture below result sample picture of PML Email Graphical View Directly from PDMS that attach to Outlook. 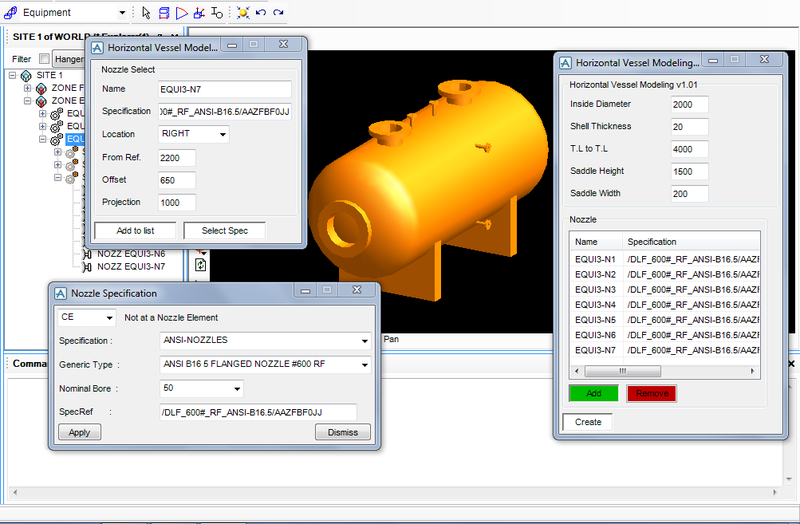 Click here to download PDMS Macro and see another model macros. and please wait updating of this. Bagi para pungguna PDMS pastinya sudah banyak yang memiliki PDMS Macro yang digunakan dalam penyelesaian pekerjaan terkait dengan PDMS tetapi banyak juga yang kurang mengerti cara membuatnya atau hanya sebatas pemakai saja. saja terkadang sulit memahami bahasa tersebut. untuk mengetahui contoh - contoh macro PDMS. Mungkin sekian dulu tulisan Belajar membuat Macro PDMS dengan bahasa PML nanti saya lanjutkan. Kalau ada pertanyaan , kritik atau saran silahkan mengisi di kolom komentar. Terimakasih banyak atas kunjungannya. 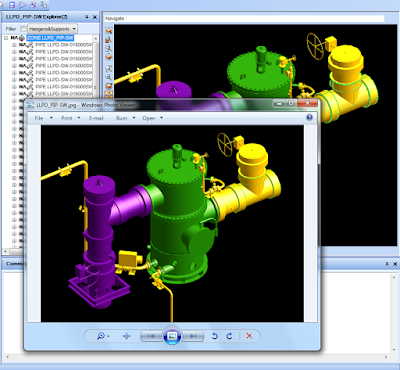 Tools PDMS untuk memasukkan atribut data linelist ke object PIPE di program PDMS guna ditampilkan di gambar Isometrik dibuat dengan PML progamming. Memang kebanyakan atribut - atribut data linlist dimasukkan dengan cara bulk load dari file Excel ke program PDMS. 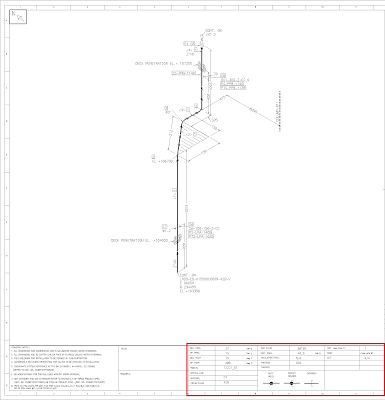 Tetapi walau begitu sering juga ada keadaan dimana harus memasukkan atribut - atribut tersebut secara manual yaitu pada saat tahap revisi gambar Piping Isometrik. Dan saat ini saya gunakan pada saat tahap revisi gambar Piping Isometrik. 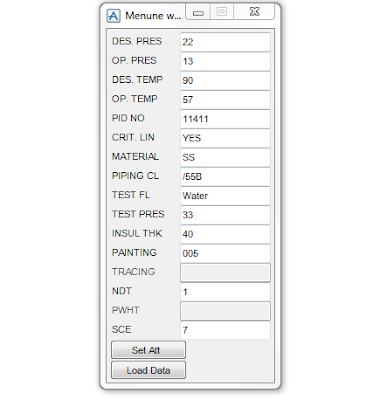 Menu Load Data : untuk menyalin data dari pipa dengan atribut yang sama, sehingga atribut yang berada di PIPE yang dipilih akan tersalin ke form / menu set Linelist. Menu Set Att : digunakan untuk memasukan data dari form menu ke PIPE. 1. Pilih Current Element pada PIPE. 2. Isi secara manual data - data linelist di menu / form set Linelist attribut atau klik tombl Load Data untuk menyalin dari PIPE yang lain dengan cara memilih / men-klik item pipa. 3. Klik tombol Set Att untuk memasukkan data dari menu / form ke atribut PIPE. 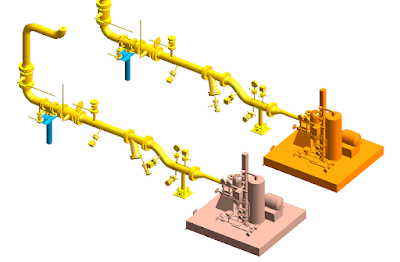 Contoh gambar isometrik yang menampilkan atribut dari PIPE PDMS. Silahkan menuju halaman kursus online untuk memesan. 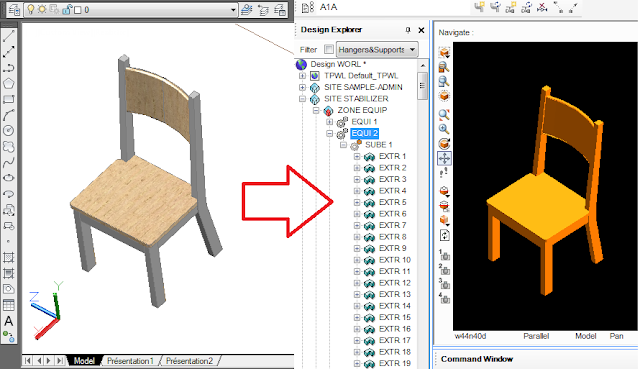 Untuk download macro PDMS ataupun AutoLISP AutoCAD silahkan buka link Download Macro.